A well-maintained battery ensures your vehicle performs as expected at every turn. The battery not only provides the juice needed for quick start-ups on demand, but also helps the alternator continually power your vehicle’s electrical components. You must give your battery the attention and care it deserves to protect the performance of your vehicle. Here are several battery care tips that will come in handy throughout the life of your vehicle. After you start your vehicle, the alternator kicks on to refill the battery’s charge and help power the full range of electrical components, from the headlights and turn signals to the sound system and gauge cluster. When the engine is not running, however, the battery alone provides power to your vehicle’s extensive array of electrical components. Sitting in your car with the dome light on or radio turned up will quickly drain your battery’s power cells unless you start up your engine. If you take short drives and switch off the engine at every stop, your alternator will not have a chance to charge up the battery, leaving the system without enough power to start your engine again. Remember to keep your car battery charged by going on a longer drive in between short stops. You should also take a lengthy drive to refill your battery charge after having your vehicle jumpstarted. Your battery uses positive and negative terminals to connect to the power and ground wires on your vehicle. The positive side is marked in red, while the negative is almost always black. You should never mix up your battery or jumper cable wires, as that could seriously damage the battery and your vehicle’s onboard computer. You also need to regularly inspect and clean your battery terminals to remove corrosion that may block the flow of electricity. Over time, your battery will start to develop serious wear that impedes its ability to send enough power through the system. You may start to notice signs of a weak charge, such as fluctuating light output and slow engine cranking, which indicate your battery is at the end of its lifespan. Battery case damage and leaking fluids also necessitate an immediate replacement. Your battery should also be replaced before it surpasses the estimated three to five year lifespan indicated by the manufacturer. When it comes time to replace your battery, make sure you go with a brand you or your technician trusts. The cheapest batteries tend to wear out fast and usually lack a full coverage warranty. If you are in need of battery service, contact your techs at The Garage Auto Repair in Broken Arrow, Oklahoma. 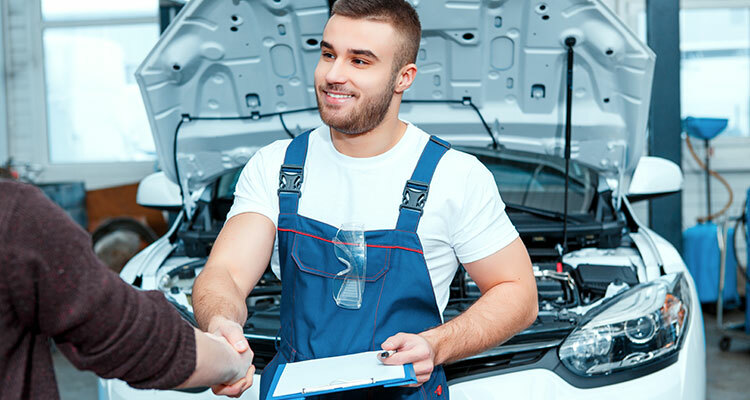 Our techs perform accurate diagnostic tests and install quality parts to keep your vehicle in optimal condition over the years.